The Black and Silver prices are very reasonable. 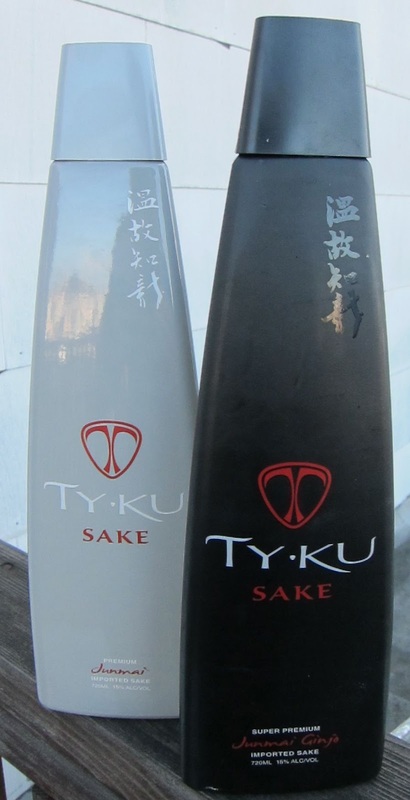 They're competitive with domestic sake even though Ty-ku has much higher shipping costs, and they're cheaper than most other Japanese sakes in those categories. I preferred the Silver, junmai, which at $15 is pretty good value. It has a mild aroma with notes of cream, melon and hazelnut. It's creamy on the palate, slightly herbal with a smooth mouthfeel. It tasted a little old to me, and sake does not improve with age, but it's still within its drinkability window. It's not a great sake, and I don't know if it will win any converts, but I've had a lot worse. The Black, junmai ginjo, smelled like hair tonic to me. It tastes sharp initially before a creamy, nutty finish that redeems it. What pleasure exists is all in the aftertaste. That said, my wife, who is Japanese and knows sake pretty well also, preferred it to the Silver because it's more complex and has more rice character; she thought the Silver was simplified for Americans (ouch!) I said I would drink the Silver with dinner but not the Black; she said the opposite. On the bright side, each of them got one vote, while many sakes that come through our kitchen get none. Especially for the Black, I wondered how fresh it was. Like the Silver, it tastes old. Sake must be shipped in refrigerated containers and should be drunk as soon as you can. If the chain of cool storage broke down anywhere along the way, including in the UPS truck to my house, that might account for the hair tonic character. I'm not willing to endorse Ty-ku, but I do give them -- whoever they are -- my support for what they're trying to do. However, I wonder if they're still trying to do it, or if the marketing outreach is an attempt to clear stocks of sake before they go bad on the shelves. To be fair, if that's what they're trying to do, I also support that. Drink now, or use it as a very attractive paperweight. The shop where I sometimes work brought the Ty-Ku brand in about two years ago. It seems to me that there was also a domestically produced, low-cost version in the line, as well. At the time, I did a little research - I even wrote to you about them - and I seem to recall something about a company in the upper midwest being responsible for the brand. I just discovered this Sake in stores near my area (Atlanta) and I have enjoyed it twice already. However, I think the branding is a little over-the-top... I would prefer a nice standard bottle instead of this 1980s Blade Runner/Star Trek thing. Ty-Ku isn't bad for a low-priced sake. It's not sour or bitter, has moderate to moderately high alcohol burn... I can't really get into "notes of this" or "notes of that" because that's like trying to ascribe some nuanced sound to the exhaust of a Ford. The company founders, a couple of American grad students from Columbia who set out not so much to make sake as they set out to create a brand image, tout it as "world's best tasting sake" but this is essentially to dupe people who have never tried anything that wasn't available at the local liquor store. But again, for the price it's not awful. I prefer the Silver as well. It has a more complex flavor that reveals itself in layers as you taste it. The Black is a little too straight forward for my taste. Fortunately, I haven't had the problem with staleness that you had. All of my samples have been fresh.